I have a question for you. Do you have a food that reduces you to a powerless puddle on the floor? One that no matter how you are NOT you can’t resist? I can’t lie. I have a handful of them. My list is largely populated by fresh breads, but near the top of the list is Easy Garlic Knots. Tender, chewy, drenched in garlic infused butter with just a hint of Italian seasonings and showered with grated cheese fresh from the oven, there is -quite simply- not much I’d rather eat any given minute of any day of any week. Garlic knots are popular pizzeria fare in this neck of the woods. Most pizza shops offer one variation on the theme or another. The truth is, though, that nothing compares to a batch that you’ve pulled fresh from your own oven. You get the triple satisfaction of having made them yourself, having made your house smell ridiculously delicious, and having the ability to plunk the entire batch of Easy Garlic Knots into a bowl that you nestle on your lap while you sit and watch “A Room with a View” for the hundredth time. I’m here to tell you that these irresistible little three-bite rolls are as easy to make as 1-2-3. 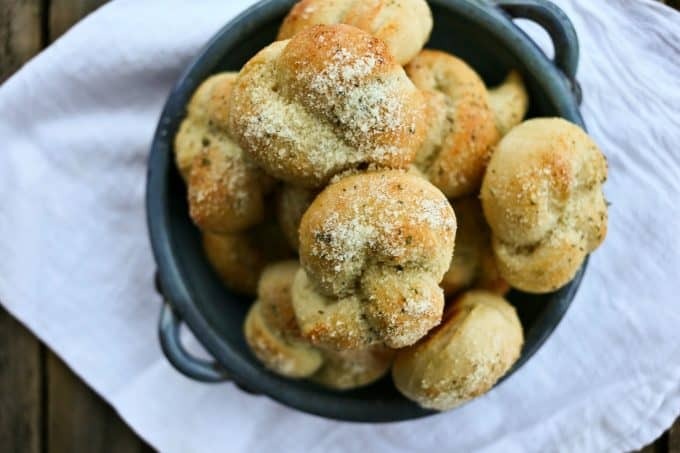 Easy Garlic Knots can be made with your homemade pizza dough or with refrigerated pizza dough picked up from your local pizzeria (many of them will sell a dough ball when asked) or deli section of the grocery store. I’ve made them both ways and loved them equally. That’s pretty self explanatory, right? Cut the dough into equally sized pieces. For a pound of pizza dough, you’ll want to cut it down into 12 pieces. That yields a pretty generous Easy Garlic Knot when all is said and done. I’m no cinematographer, but I put this quick video together for you to show you how easy it is to shape the Easy Garlic Knots. Roll out each piece into a 6 to 8 inch rope. The video shows the rest of the process. Okay, so that’s more like squishing three steps into one, but it’s really all part of the same thing. The garlic butter soaks into the Easy Garlic Knots as they bake, then softens them and holds the grated cheese onto the finished Easy Garlic Knots. Can we call this one step? Granted, I’m entirely likely to make a meal out of Easy Garlic Knots and a bowl full of marinara sauce, but if you’re exerting more willpower than I have, they make a lovely accompaniment to soups, stews, salads, pizzas, and all manner of other, more-grown-up-meal-fodder goodies. If, however, you opt for the Foodie with Family approach and gorge yourself on a bowl full of Easy Garlic Knots, rest assured your secret is safe with me. As long as you share an Easy Garlic Knot with me. Don’t worry about making all of your knots identical. There’s some charm in unevenly shaped rolls. It’s the rustic effect; the proof-that-it’s-homemade. As long as they’re roughly the same size, you’re good to go and that has more to do with the fact that they’ll cook at the same pace than it does the appearance. Do NOT skip making these if you don’t feel like making homemade pizza dough or are nervous about working with yeast doughs. 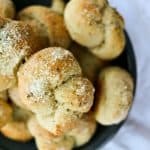 I make Easy Garlic Knots at least as often using refrigerated dough balls from the grocery store or local pizzeria as I do from homemade dough. Some nights you just want Easy Garlic Knots and you don’t have the time to wait for the dough to rise. You’ll still need to let it come to room temperature, but -depending on how warm the ambient temperature is- that purchased dough can be room temperature in almost the amount of time it takes you to put it in your cart, do a circuit of the store, and drive home. While your Easy Garlic Knots are rising on the pan, preheat your oven. It’s better to have the oven waiting on you than to have super-risen, over-proofed dough waiting on the counter for the oven. Garlic butter. Let’s talk about it. When I’m feeling particularly lazy about dishes, I put the garlic, Italian seasonings, and butter together in a bowl and microwave it ’til the butter is melted. That does a plenty fine job of infusing it and then I just flop the bowl into the dishwasher when my Easy Garlic Knots are done. If I’m feeling motivated, I slowly melt the butter in a saucepan over ultra low heat with the garlic and Italian seasonings in it. I may be imagining things, but I think they taste like they were made with a little more love when I do it that way. On the other hand, I don’t usually spend enough time eating them to taste that little bit of extra love, so use whichever method you prefer. Not all food needs to be virtuous. You know how I always say there’s a time and a place to use the shake-on, green canister cheese? This is both the time and the place. While I’m normally a hard-and-fast user of the grate-it-yourself variety of Parmesan or Romano cheese, there’s something absolutely perfect about shaker cheese here. It fits the pizzeria vibe, so I say go for it. Line a baking sheet or half sheet pan with parchment or a silpat. Set aside. Cut the pizza dough into 12 equally sized pieces. Roll each piece into a 6 to 8 inch long rope. Cross the ends of the dough over each other and tie into a simple knot. Place each knot on the lined sheet pan, leaving at least 2 inches of space between them. Cover with a clean, dry towel and let rise while the oven preheats to 400°F. Melt the butter together with the garlic and Italian seasonings, taking care not to toast the garlic. After the oven has heated up fully, uncover the knotted dough and brush lightly with the garlic butter. Bake for 15 to 20 minutes, or until the dough is golden brown and set. Brush the Easy Garlic Knots generously with the remaining garlic then sprinkle Parmesan or Romano cheese on with abandon. Serve warm plain or with a bowl of warmed marinara sauce. 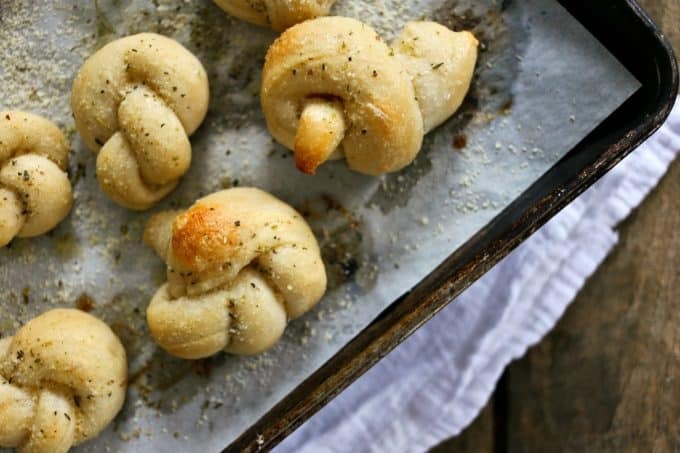 Mmm I love me some garlicky bread…these knots look dangerous! I could eat an entire batch of these for dinner….I love bread! 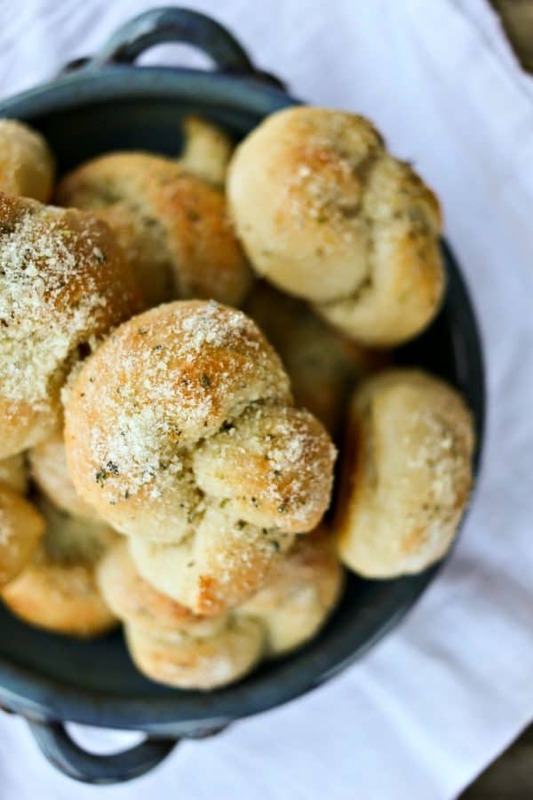 If only garlic knots could be at every meal instead of dinner rolls the world would be a much happier place! Pinned for later. I need these in my life. Bread doesn’t reduce me to a puddle, but garlic might–Lol. I love the line to us all not to worry if all our knots were not the same. Perfectionism—-very comforting—Lol again. Looks delish just glistening with goodness. New web design too—whoopee and I am adding some new features. Made these garlic knots to accompany a homemade beef, vegetable and barley soup last night. Ohhh, mama!! The garlic butter put them over the top. I was a very happy camper. Thank you for this wonderful recipe which will be repeated often. That is AWESOME, Jane! I’m glad you liked it like we do!